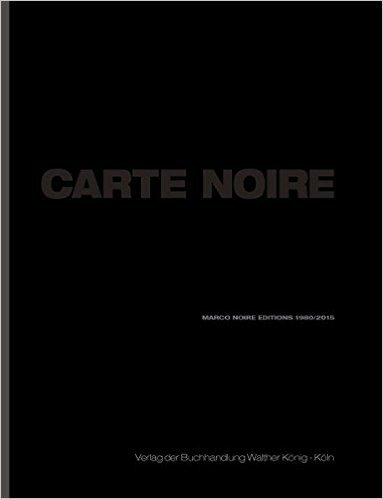 Carte Noire documents the intense publishing work by Noire Editions : refined artist books, drawings and manifold prints. A spectrum of artists including great names of Arte Povera, Giovanni Anselmo, Alighiero Boetti, Mario Merz, Giulio Paolini, Giuseppe Penone, Gilberto Zorio and also of well known representatives of contemporary international art such Hamish Fulton, Richard Long, Sol LeWitt, Maurizio Nannucci, Shirin Neshat, Richard Nonas, Jonathan Moonk, David Tremlett , etc. The book title refers to the Carte Noire edition which the artist Giulio Paolini dedicated to Marco Noire, and as Gabriele Detterer wrote in the introduction : ‘’The color ‘’black’’ generates strong visual contrasts; and, in a figurative sense, the variety of manifold editions collected in this book is ‘’lit’’ by such contrasts. Together used with the color-term “Noire”, the word Carte draws attention to the earliest material adopted for writing and printing: paper ‘’. Over the years Noire has experimented with different working typologies to interpret the artists projects. Every work becomes an event. With about 395 coloured illustrations, his volume documents the development of the Art editions from the 80’s up to today. hardcover. Publisher: Buchhandlung Walther König, Köln, 2016.